Thanks to http://jbacteria.retrolandia.net/ for hosting it and many other games. Twenty Eight years ago, Two 13 year old boys were sat in their living room after school. A new game had been acquired. One of them places a tape into the deck of the Spectrum +2 and 3 minutes or so later, it loads. The loading screen showing an armoured space marine in what appeared to be MotoX armour, the cassette box looking like a scene from a sci-fi movie. Having both seen Alien and 2001, the atmosphere could be cut with a knife. The game loaded and play began. The case lay strewn across the floor in the usual manner - we didn't need instructions - we were kids - we knew how to game! The space marine glided effortlessly into the Novar base on a personal hang glider and landed at the starting screen, all was quiet apart from a heart beat - rendered through the beeper with a Chwee Choo sound. We quickly got to grips with the controls. Jumping was tricky but the added power boost made jumping large distances possible and tricky terrain easy. The first room seemed easy enough, no enemies - moving to the right presented some sort of ledge, moving quickly.. Woah, stop. Gas traps. It's just gas, it'll be OK in the space suit. Using the power run, We attempt to run through the gas but alas the space marine dies with a shrill and a contorted image. Looks like the gas eats through the suit. down to 2 lives. Carefully timing the run until after the gas has dissipated, yields the next room. Aliens and a laser firing into the rock in a pit. A quick round of weapon fire should take care of the aliens and we'll leap over the pit.. OK, where's the weapon? Can't see the weapon right now. The aliens seem to be moving in a predictable pattern, we'll be fine as long as we stay out of their way. Oh no! An alien coming from the previous screen, that screen was clear, it must have followed me. One life left. Avoiding the aliens, we jump up to where the the laser pit is and power run and jump over the pit. Trap avoided! The next room has a moving platform. We leap onto the platform and ride it over to the other side. We're then presented with two hydraulic rams moving up and down aside a hole in the ground, our obvious destination, a quick leap down towards them - Boing, a trampoline propels us towards the rams. Not wanting to touch them - we hold back and wait until they are high enough to pass between them and drop down the hole. The next room is strange, no hazards at all. Just some arrows on the ceiling pointing up and a moving floor, moving towards the right. We attempt to jump off the ledge towards the exit. What is this? We're floating up - but we can move mid-air. We move towards the end of the arrows and fall. Obviously these have a finite influence over localized gravity. We move left, towards the only exit. The moving platform prevents us from simply walking, instead we power-run. The room to the left appears to be a large chunk of tech, but it blocks our progress, even power jumping cannot clear it. Above the tech is a hole in the ceiling, it must be the chasm the moving platform carried us over. To the left of the tech is an exit to another room. Back to the right then, up the lifter and jump up to the previous screen, avoiding the hydraulic rams. Boing. The trampoline catapults us towards the sheer cliff - but not high enough. There has to be a way up. Maybe a run-up, between the rams, landing on the trampoline and power jumping will be enough to get us up to the top. Boing, we're at the top of the cliff we came down earlier. This was the wrong way. Just get back onto the moving platform. A mis-timed jump meant that the marine slid down a surface and landed in the screen with lots of tech. We'd have to go back to the gravity lifter, avoid the rams and use the trampoline jump again. This is tricky stuff. Eventually we make it and slide down the surface on the other side. Placing us at the other side of the tech obstacle. We walk to the left and see bladed balls falling slowly into what appears to be lava or acid, in any case it's hot and bubbling. Above us is a pit with lasers.. hmm, I wonder if jumping down the pit at the start would bring us here. A running jump over the lava seems to be the only way. We'd have to wait for it to be clear otherwise it'll be death from bladed balls. Death it was. A misstep, landed us in the lava. No Men Left - Game over. The instructions on the case inlay were studied. Unusual for us, but this game was hard! Where is the weapon? On the case there's a weapon. The cover-art shows a weapon very clearly. There, right there in the instructions, it says you're armed.. Where's the gun?! It appears that our marine forgot his weapon. There is no combat in this game. I mentioned "We" a lot because it was my Brother and I taking it in turns to see who could get the furthest, and although the preceding paragraphs may have been long and detail heavy, it doesn't even come close to the amount of time and effort it actually took to make it this far. The failed attempts, the deaths. Death by aliens, death by hydraulic rams, death by gas, by lasers, by bladed balls. But it was interesting. We both still have muscle memory dedicated to defeating the first few rooms of this game. Then it turned out that the majority of the rooms described so far could have been skipped by hopping down a hole guarded by a timed laser. The constant heart beat kept the tension and the shrill of death was actually something quite unpleasant and was feared. Each room was filled with frustrating and often deadly obstacles to be overcome, but with practice and patience - it was possible. All the while the marine's heartbeat would pound in our ears - Chwee Choo. Over exerting or scaring the marine would increase his heart rate and would mean he couldn't perform power runs or jumps; meaning that you had to wait for him to calm down before you could proceed. Run or power jump too much, dangle from moving platforms for too long or fall too far and your heart will be pounding with the marine's. Chwee Choo-Chwee Choo-Chwee Choo. After many hours of play, we finally made it to the Bomb room in the Novar base. A siren blares and a timer on the screen begins to count down - we now have to make it back to the exit room we passed some screens ago and a short time it seems to get there.. now where was it? A mad scramble back up through screens we fell from, alternate paths with new challenges - never before experienced and must now be overcome while under time pressure. All the while the marine getting more and more out of breath. This game was terrifying. It lured you in with it's simplicity and then beat you over the head. It's graphics were colourful, yet alien. The locations often seemed functional in some odd way. The traps were clearly identifiable (a sign of good level design). A great deal of care had been taken in this game's construction - and it was all made by a single person. In the first few screens, the player learned pretty much everything they needed to play the game. They also got a taste for the danger which lay deeper into the complex. The lack of a weapon was novel. It meant that players had to think their way out of situations rather than rely on combat prowess. This was a thinking boy's game - A game which rewarded patience and clear thinking. There was an element of luck, but mostly death came because the player messed up. Careful leaps, timed jumps and a clear head were needed to progress to the ultimate goal. I'll be honest, My Brother and I never made it back to the exit screen on any of the levels (or at least he never told me that he did, I imagine he would have as it's kind-of a big deal). We got close, only a couple of screens away. But the bomb would always detonate and it was Game Over. A lot of people cite games like Manic Miner, KnightLore and AticAttack as their classics for the ZX Spectrum. 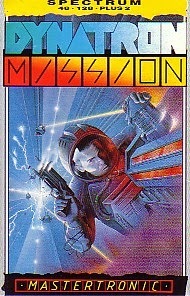 However for me, near to the top of my list is Dynatron Mission. A game so tense, so difficult and so atmospheric I will never forget it. It is unfortunate that it remains an obscure title that only a handful have played. I encourage you all to play the game - there is a link at the top of this review. I do wonder whether a game like Dynatron Mission would be possible on modern platforms. The difficulty curve might put most people off. I do wonder why it enraptured my Brother and I. We had other games, but nothing had the atmosphere, especially when played along-side Holst's The Planets Suite - played on a record player. I've been unable to find recent activity for Paul Hargreaves on-line. I would like to thank him for this game. It has certainly been an inspiration.